This article is about the handheld video game system. For the Mario Kart DS battle course, see Nintendo DS (battle course). "DS" redirects here. For information about the web Flash game, see Dribble Skillz. The Nintendo DS is a handheld game system released by Nintendo in 2004. The Nintendo DS is Nintendo's fourth handheld system; its predecessor is the Game Boy Advance. It features two 3-inch screens. "DS" stands for "Dual Screen" (though, at its conception, it was intended to stand for "Developer's System"). The system introduces many new features to the Nintendo handheld lineup, including a resistive touchscreen, visible operating system GUI (in the form of the main menu), stereo sound output/audio input via microphone, and wireless connection capabilities. It is also the first Nintendo handheld to support 3D polygonal graphics as opposed to only sprites. As with previous major Nintendo handhelds, the DS and DS Lite provides backwards compatibility for Game Boy Advance games (though this does not work with the Nintendo DSi family), although only limited to single player experiences as the link cable and wireless adapter support are missing. The charger provided with the First Generation DS is the same connection as the Game Boy Advance SP. It is also the handheld counterpart of the Wii. The DS is the first Nintendo system to include wireless functions, allowing it to link up with other DS's without any wires or add-ons. This was also the first system Nintendo made to go online (Mario Kart DS being the first Nintendo-made online game), using the Nintendo Wi-Fi Connection. On the original DS and the DS Lite, WPA encrypted networks are not supported. The Nintendo DS had the , , , , and buttons from the Game Boy Advance, plus two new buttons: and , making it identical to the SNES. Before the official name's release, Iris was the first codename for the handheld that would be the successor of the Game Boy Advance. Later, it was called Nitro when the new device created had two screens. The Nintendo DS (including DS Lite, DSi and DSi XL) sold 128.90 million units as of 2010, making it Nintendo's best selling video game console and the highest-selling handheld console in the world. In February of 2011, the DS line was superseded by the Nintendo 3DS. Since May 20, 2014, online play for many Nintendo DS games has been discontinued due to the closing of the Nintendo Wi-Fi Connection service. The DSi Shop was later discontinued on March 31, 2017. The graphical capability of the DS is said to be on par with the Nintendo 64, albeit with enhanced 3D modeling but more pixelated textures due to lack of texture filtering. A newer model named the Nintendo DS Lite was released in 2006 and contains all the features of the original Nintendo DS with some new features such as a significantly brighter screen (with four adjustment options), a lighter weight, and a smaller overall size (having the negative side effect of a regular Game Boy Advance cartridge protruding out from the bottom, similar to playing a Game Boy or Game Boy Color cartridge in the Game Boy Advance). The Nintendo DS Lite sold 89.19 million units as of 2010. It was also the final handheld system to have backwards compatibility with Game Boy Advance games. A third model, called the Nintendo DSi, was announced on October 2nd, 2008. It is thinner, lighter, and brighter than the Nintendo DS Lite, having removed the Game Boy Advance slot. However, this means that the Nintendo DS Rumble Pak, which was used with titles such as Mario & Luigi: Partners in Time, cannot be used. Two cameras, music playback functions, Wi-Fi, internet browser, larger screens, and a Wii-like channel interface were added. Additionally, the console supports WPA encrypted networks. 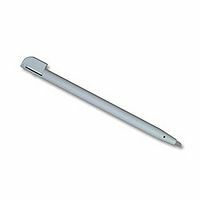 The stylus is a pencil-like accessory that comes included with the Nintendo DS system. The instrument is often used in conjunction with the touch screen. Usually, the stylus is used to make menu selections, which the player can do by bringing the stylus in contact with their selection on the touch screen. The stylus is often helpful or required in gameplay. For example, New Super Mario Bros., Super Mario 64 DS, and Wario: Master of Disguise require the use of the stylus for minigames such as Wanted! and Roach Smash. The stylus is also necessary to make Mini Mario toys jump, in Mario vs. Donkey Kong 2: March of the Minis. On the DS, the stylus slot is located on the back, and is inserted downwards, relatively to the DS itself. On the DS Lite and DSi, however, it was relocated to the right side of the system, and is inserted from right to left, relative to the DS Lite or DSi. The stylus for the DS is noticeably thinner than the stylus for the DS Lite. 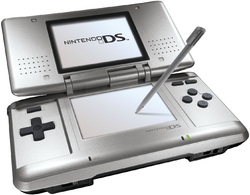 A DS generally comes with two styluses, and extras can be purchased from stores or special ones from promotions. The Microphone is a feature on the Nintendo DS. On the original DS, it is at the lower left-hand corner, right below the screen. On the DS Lite, it is at the middle in between the two screens. Its function is to accept audio input. On the DSi, this position is replaced by the Camera, and the Microphone was moved about 2 cm to the right. Blowing into it will allow events to happen in the game that the player is playing, such as Toad Jump. In other games, the player must say words into the Microphone. In Mario & Sonic at the Olympic Games, the player must clap into the mic to gain inspiration from the crowd in Long Jump and Triple Jump. Also, in the game Mario & Luigi: Bowser's Inside Story, the player needs to use the microphone at certain points, such as breathing out fire as Giant Bowser. This accessory is shaped like a Game Boy Advance game pak, which it plugs into the bottom of the Nintendo DS. It is incompatible with Nintendo DSi or Nintendo 3DS. Some Mario games are compatible with it, such as Mario & Luigi: Partners in Time. The plot of WarioWare: Touched! revolves around Wario obtaining a gaming console resembling a Nintendo DS and using it to market new microgames. Occasionally, a Nintendo DS can be seen in the Pushing Buttons microgame. One of the battle courses in Mario Kart DS is the Nintendo DS. Also some billboards in Mario Circuit features a picture of the DS. 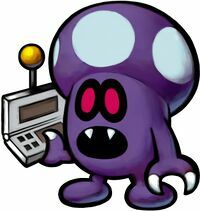 In Mario & Luigi: Partners in Time, Shroobs call Shroob UFOs by using a silver, flip-top communicator. Because the Nintendo DS has the capability to send verbal messages to friends, this may be a reference to the Nintendo DS. Additionally, Professor Elvin Gadd is shown to own a Nintendo DS with an apparent time radar he used to locate Princess Peach at the beginning of the game; he later uses the DS to operate the Hydrogush 4000. In Mario & Luigi: Bowser's Inside Story, the Emoglobins that run the Gauntlet and Cholesteroad are shaped like DS systems. Additionally, Dark Fawful uses a device that resembles a Nintendo DS to track down the Dark Star. In WarioWare: Smooth Moves, a Nintendo DS appears in the microgames Brain Age, and Wario Hunting as one of the possible baits. Super Paper Mario includes a computer console called the Dining Specializer, which is modeled after the Nintendo DS Lite (and can also be abbreviated "DS"). There is also a two-screened handheld that resembles a Nintendo DS known as a Training Machine, which the fortune teller Merluvlee wanted to use to train her brain (which, in turn, is a reference to the popular DS title, Brain Age and in PAL regions "Brain Training"). In Mario Strikers Charged, Strikers' Times are shown on the Touch Screen of a Nintendo DS Lite. In Mario Party DS when the player defeats Bowser at the end of the story mode, the five Sky Crystals join and form something like a crystal Nintendo DS, unlocking Triangle Twisters. One of the names that can appear whenever a player presses the random button when they're naming their custom stage is "DS". Also, a stage based on the PictoChat included in the Nintendo DS makes an appearance in Super Smash Bros. Brawl, complete with its very own DS emblem. Finally, in the Trophy Hoard option, a black Nintendo DS Lite appears in the background with the presents. Super Smash Bros. for Nintendo 3DS features a successor to the original PictoChat stage, PictoChat 2. In Donkey Kong Country Returns, if left idle for long enough, Donkey Kong will pull out a Nintendo DS Lite to play a game. In Luigi's Mansion: Dark Moon, Luigi uses a device called the Dual Scream to communicate with Professor Elvin Gadd. The Dual Scream is essentially the equivalent of the Game Boy Horror (similar to a Game Boy Color) that Luigi uses in Luigi's Mansion. If the DS or DS Lite is turned on on the date that the user has set as their birthday, a high pitched chime will play. The DSi and DSi XL will not do this. At one point, a special "Pink Ribbon" Nintendo DS Lite was released in late September 2008. For every one bought, $5 would be donated to the Inflammatory Breast Cancer Association. One of the possible names for the DS was City Boy. This name made it possible for Nintendo to continue the Game Boy brand (seen as a child's toy) while trying to appeal to an urban young adult crowd. The Nintendo DS is the only handheld system to have neither a Player's Choice or Nintendo Selects label on select video games. This page was last edited on April 6, 2019, at 08:17.